If you have children, younger siblings, or even nieces or nephews in elementary school, you know what a big deal Valentine's Day is for them. Remember when you were that age? You couldn't wait to pick out the best Valentines and candies for your classmates, and receive cards in return! Too bad we didn't bring that tradition over to the workplace--it would certainly make the workday more fun on Valentine's Day! Even if you're too old to hand out cutesy Valentines to all your co-workers, you can help your kids have the best Valentines Day ever! If you still haven't gotten cards for your children's classroom celebration, come to Swoozie's. We have Valentines that cover all categories--from funny and cute to sentimental and sweet, we've got it all. Plus, if you want them personalized, we'll have them ready for you by the next day! We helped our friend Amy from Amy's Party Ideas find Valentines for her son's class. She chose Pirate Valentines for the boys and Love Bug Valentines for the girls. The cards she picked even came with little temporary tattoos! Those are sure to be a hit in any classroom. 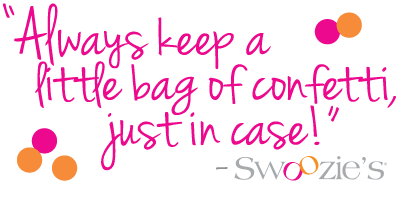 Share your Swoozie's Valentines celebrations with us by using the hashtag #SoSwoo! We might even feature you on our Instagram feed! The Swoo Celebrates 14 Years!